The AT&T 3B2/400 was a small, multi-user UNIX computer developed by AT&T in 1985. It was part of the larger 3B family of UNIX computers based on the Western Electric WE32000 and WE32100 series of CPUs and peripherals. What makes the 3B2 historically interesting was its use as the primary porting platform for AT&T UNIX System V Release 3. One or two 30MB, 72MB, 135MB, or 161MB MFM hard disk drives. Since internals documentation for the 3B2 series are not readily available, the simulator was made possible through a reverse-engineering effort, studying the System V Release 3 source code, and lots of caffeine. Please be aware that on 14 January, 2019, there was a major change and new releases of the simulator (anything including and after git checkout ae0cad26) will require config file changes. Renamed floppy disk device to IFLOPPY, and hard disk device to IDISK, to avoid conflicts with SIMH built-in command names. Also fixed a bug that prevented the simulator from using read-only floppy disk images. Fix for DUART initialization that prevented automatic reboot. Several timing and terminal fixes from upstream SIMH. Fix for critical floppy timing issue. Support for CIO ("Common IO") expansion cards. PORTS and CTC cards are now supported. PORTS cards each provide 4 serial lines, and up to 4 PORTS cards are supported. CTC cards provide a 23MB Cipher "FloppyTape" tape backup solution. One CTC card is supported. Major fix to DMA and CONTTY serial support. HD135 and HD161 are now both recognized names for the Maxtor XT1190 disk drive. Fix for CPU traps. The UNIX debugger sdb should now work correctly under System V Release 3. Fixed a FIFO overflow bug in the CONTTY device. Improved support for multiple hard disk drives, as well as adding support for additional hard disk geometries. Added support for the secondary on-board serial terminal (CONTTY). There are two ways to get the current simulator. You can download a binary version that has been pre-compiled for your operating system, or you can build the source code yourself. The source code is open source, and available on GitHub. The binary will be built into the ./BIN/ directory. You should then be able to build BuildROMs.vcproj followed by 3B2.vcproj. The 3B2 line ran AT&T UNIX System V as its native operating system. To my knowledge, no other operating system was ever ported to them. The very earliest 3B2s shipped with AT&T UNIX System V Release 1, but they almost immediately started shipping with AT&T UNIX System V Release 2, and after it became available, Release 3. The last version of System V supported by the 3B2/310 and 3B2/400 was System V Release 3.2. Later 3B2 computers, such as the 3B2/600 and 3B2/1000, could run System V Release 4. If you would like to install UNIX from scratch, there is now a guide that will walk you through every step. I encourage you to try this method, but if you don't want to go through all that work, keep reading. To make getting started as painless as possible, I have prepared several hard disk images with AT&T System V Release 3.2 UNIX pre-installed. To use any of the images below, simply download it, uncompress it, rename the uncompressed file to hd161.img, use the supplied boot.ini file (editing it to suit your own needs), and start the simulator. The UNIX installations on these images are pristine and have not been configured. No system passwords have been set. You will have to log in as the setup user to do a system setup. The Base UNIX image holds a minimal installation of the first six Essential Utilities disks, along with the Cartridge Tape Utilities and CTC driver, but nothing else. AT&T UNIX System V Release 3.2 Source Code Provision installed under /usr/src — you could rebuild the entire system from source if you wanted to. A complete description of SIMH would be much too long for this document, but in brief, it is a platform for writing and hosting computer simulators. SIMH implements a great number of simulators, of which the 3B2/400 is only one. Below is a "Getting Started" guide to help ease you into the world of SIMH in general, and using the 3B2/400 specifically. To quit at any time, just type quit and press the Enter key. This will launch the simulator and run all the commands in the file. This line sets the available system memory to 4MB, which is the maximum amount that a 3B2/400 could address. Other options are 1M and 2M. This enables CPU idle support. Idle support lets the simulator use less host CPU. If this line were not present, the simulator would use 100% of one host CPU core. This command tells the simulator what type of hard disk is attached. idisk0 is the first emulated hard disk drive (idisk stands for "Integrated Disk"). A second hard disk may optionally be attached as idisk1. HD161 tells the simulator that the hard disk is a Maxtor XT1190 161MB MFM hard disk. Other options include HD30 for a 30MB hard disk, and HD72 for a 72MB hard disk. Unless otherwise specified, HD72 is the default, because a 72MB hard disk was the largest that AT&T originally shipped with the 3B2/400. This line attaches the disk idisk0 to a virtual hard disk file named hard_disk.img, creating the file if it doesn't exist. Note that the 3B2/400 expects hard disks to be low-level formatted before they can be used. That is addressed later in this document. The 3B2/400 floppy disk uses double sided 80-track diskettes with 9 tracks per sector and 512 bytes per track, for a total disk size of 720KB. These two lines create files to store the state of NVRAM (Non-Volatile RAM) and the Time-of-Day Clock. When these devices are attached, the 3B2/400 simulator will remember important settings and the current time of day between boots. All 3B2/400s have two serial ports on the system board: One for the console terminal, labled CONSOLE, and one for a second serial connection, labeled CONTTY. This command enables the secondary serial port and attaches it to Telnet port 9000. You can then use a Telnet client to connect to the host that the simulator is running on on port 8000, and you will be connected to the virtual CONTTY serial line. The PORTS card is an optional expansion card for the 3B2/400. Each PORTS card supports 4 serial terminals, and up to 4 PORTS cards may be installed in a 3B2/400. These commands enabled PORTS support, sets the number of simulated terminal lines to 16 (4 cards), and listens for connections on port 9000. You may see several different messages. This is normal. Once the 3B2/400 has booted at least one time, and stored its settings into NVRAM, this message should not be repeated. If the hard disk image you've attached idisk0 to has not been formatted yet, or if no disk image is attached, you will see the following message. Once the disk image has been formatted, or if you use a pre-built image from below, you should no longer see this message. IMPORTANT: The SYSTEM FAILURE line is actually an invisible password prompt! Type the default system maintenance password, which is mcp, and press Enter to continue. Simply type unix and press Enter. Finally, you will be asked which device to boot from. Enter 0 to boot from the floppy disk, or 1 to boot from the hard disk. Once UNIX has been installed to the hard disk, the system always boots automatically from the first hard disk. To stop SIMH at any time, type the control sequence Control-E. This will return you to the SIMH prompt (sim>), where you can type quit. One interesting challenge is, "How do we share data between the host system and the emulated 3B2?" There are three options available for this, ranging from simplest to hardest. C-Kermit is a very simple program that transfers data over serial lines. It's very easy to use. The main downside is that transfers are very slow. They're limited to the speed of the emulated serial port, which is 9,600 baud by default, and cannot go above 115,200 bps. Caveat: On the emulated 3B2, the size of file you can transfer is limited by the ulimit setting, and by default cannot be more than 1MB in size. You may increase the ulimit to overcome this limitation. C-Kermit for the 3B2 (below). C-Kermit for Linux is available through most distribution's package managers. NOTE: You can skip this step if you have used the pre-built hard disk image from above, because it already includes C-Kermit 5A(189) pre-installed. Start Kermit on your host system. Be sure to replace the IP address and port with the appropriate values. When Kermit has connected to the CONTTY device, press Enter a few times until you see a login prompt. Log in as your standard user on the 3B2. Your file should transfer to the 3B2 at about 1200 bytes per second. Not blazingly fast, but tolerable. This method is quite easy to use, but unfortunately limited to files no larger than about 22MB in size, since that's the size of each blank tape. The basic idea is to write a CPIO archive to a specific location on a blank tape image under Linux, and then in SVR3 to read the CPIO archive out of the raw tape device. Use dd to write the archive into the blank area of the tape. By passing the seek=31 flag, we skip the tape header and seek to the actual data area of the tape image. Now we can restore from tape, just like you would on a real 3B2. This will restore the contents of the tape archive to the current directory. This method is really a tremendous hack, but it's probably the fastest way to transfer very large that are too big to fit onto a CTC tape image. The basic concept is the same as the one used for CTC tapes, except you're writing to a blank area of a hard disk instead. Prepare a blank hard disk image with a valid low level format, partition table, and VTOC. If you need a pre-built image, one is available below. Download the file hd72_xfer.img.gz and uncompress it. Use dd to write the archive into the blank hard disk image. By passing the seek=810 flag, we skip into an unused area of the disk. Now we reverse the process on the 3B2 by using dd and cpio to read from the raw emulated disk. If your only experience with UNIX-like systems is through modern Linux, you should be aware of a few things. First, SVR3 is not loaded with fancy utilities like Linux. The base 3B2 installation doesn’t even come with man pages. Second, you don't (by default) get a backspace character. That’s not a problem with the simulator, that’s really how SVR3.2 works. If you want to delete a character, you have to type the pound / hash symbol (#). And if you want to delete the whole line and start again, you have to press the at symbol (@). 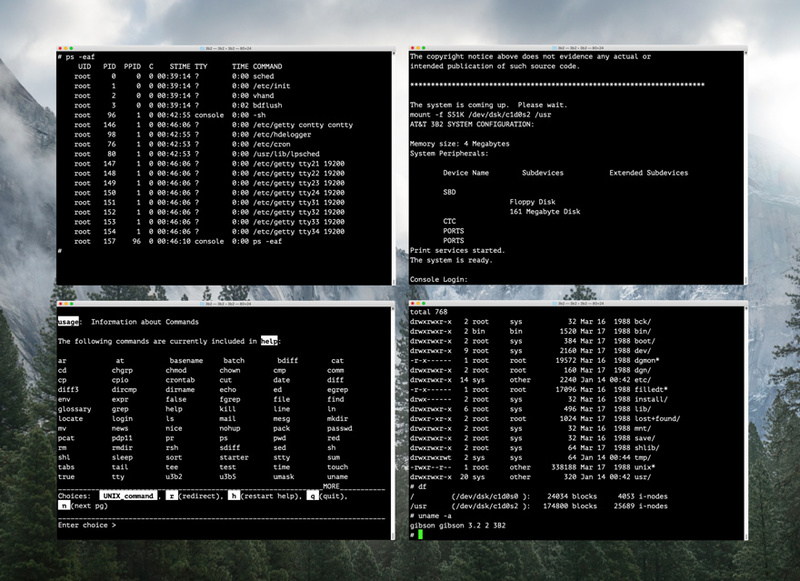 You can change these default terminal control characters to something more familiar with the stty utility. If you want to use the vi editor in visual mode, you will need to define your TERM environment variable to something that SVR3.2 recognizes. It’s generally safe to set this to vt100. You can put this into your .profile file to set it automatically each time you log in.